Two of them have been used on a building that raises the bar for primary school design. 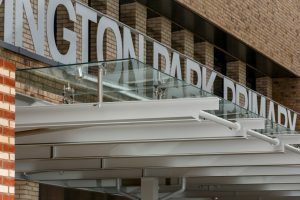 Pioneering polycarbonate roofing supplier Twinfix has marked the first use in the UK of its premium bolted glass canopy. In fact, two of its new “spider-bolt” contemporary canopies have been used at the new Trumpington Park Primary School which supports the new Great Kneighton housing development near Cambridge, along with an existing secondary school and existing library building. 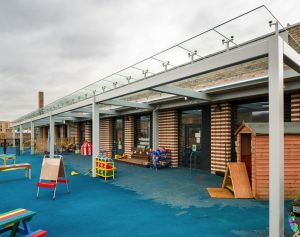 Designed by architects Frank Shaw Associates for main contractor Kier, the design was based on Bulletin 103 guidance but was developed in close consultation with the sponsor Cambridge Primary Education Trust (CPET) and Cambridgeshire County Council and was tailored to suit their preferred educational vision and pedagogy. 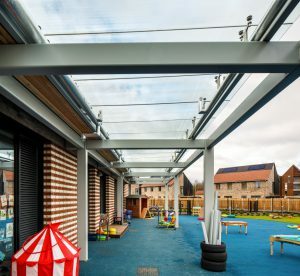 One 20m long canopy floats above the main entrance, the other runs for 40m along the children’s outside activity learning zone. The former comprises 1.5m2 panels of 13.5mm of clear heat soaked glass used alongside cedar wood panelling*, the latter 3.2m long x 1m wide panels of 19.5mm, both with a 1.5mm interlayer of PVB (Polyvinyl Butyral resin). 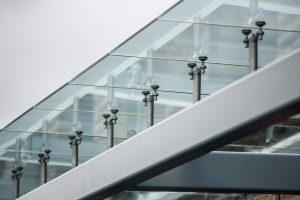 Norman Paterson of Frank Shaw Associates said the Twinfix bolted glass canopies specification had been a main contractor preference and they had “complied well” with the aesthetic and performance requirements of the project and were a “good looking product”. 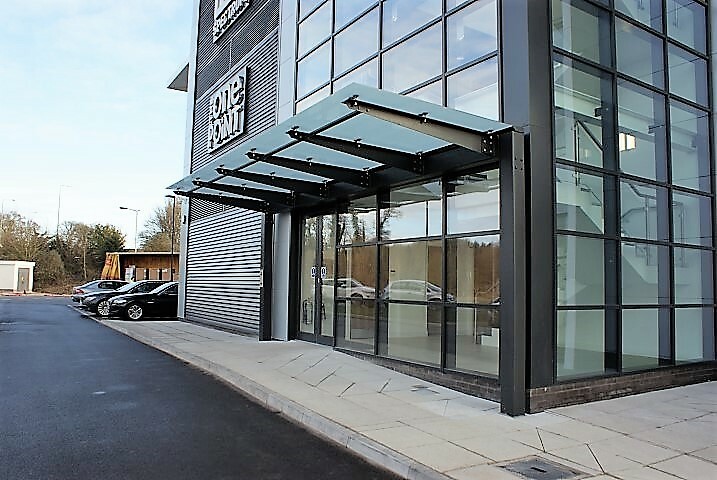 The pre-drilled bolted glass canopies were installed to a 2 degree pitch by Twinfix’s in-house team using a hired spider crane, tower scaffold and walk-safe gutters to lift the 70kg panels onto an existing frame of vertical and horizontal galvanised steel supports. At Trumpington Park the canopies abut the building’s façade above the galvanised steel plinth while at the other end, they deliberately fall short of the horizontal supports at the entrance and overlap them at the outside activity learning zone. 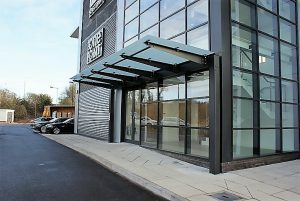 These cantilever canopies are also designed to be reverse pitch to allow drainage into a gutter next to the building and to keep the overall look sleek. Manufactured from galvanised steel and glazed with laminated glass, they are fixed using satin stainless steel bolts with silicone seals. 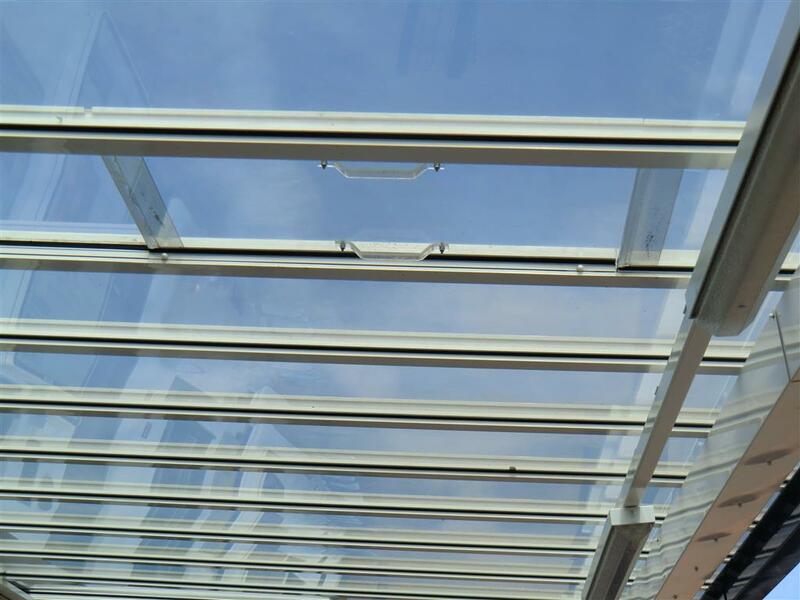 The use of bolts to fix the glass, rather than glazing bars, creates clean lines and large, open areas of glass. 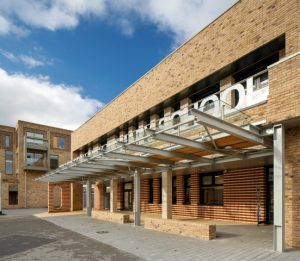 The school’s design was subject to the Great Kneighton Design Code and was required to play a key role in the fulfilment of the wider masterplan – a challenge for a 630-pupil primary school where child safeguarding was paramount. The solution was a simple plan on a north/south axis with east/west facing classrooms. This resolved a contradiction of the masterplan where southern pedestrian entry from School Square was required with vehicular entry from the north. This was a challenging arrangement for a primary school as it would otherwise have split the site. 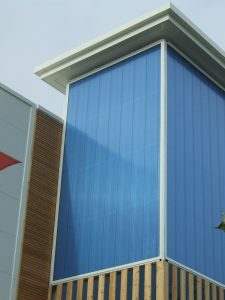 The use of a deep plan allowed a favourable enclosure ratio matching the challenging cost plan. Organisational simplicity has allowed a structural simplicity suitable for cross laminated timber. This in turn allowed the remarkable nine-month build time to be achieved. The Twinfix canopy at the entrance is credited by the architects with helping to complete and make meaningful the cloister theme of School Square. Entry to independently operating parts of the school are all from the square ensuring maximum use of the public space while internally a ‘Heart’ space is created through use of the multi-functional library which is also used as a hall extension and at times circulation space. Through painstaking care the 3,380m2 (GIA) building on a tights 2.3-hectare site transcends budget and significantly exceeds expectations for this building typology. 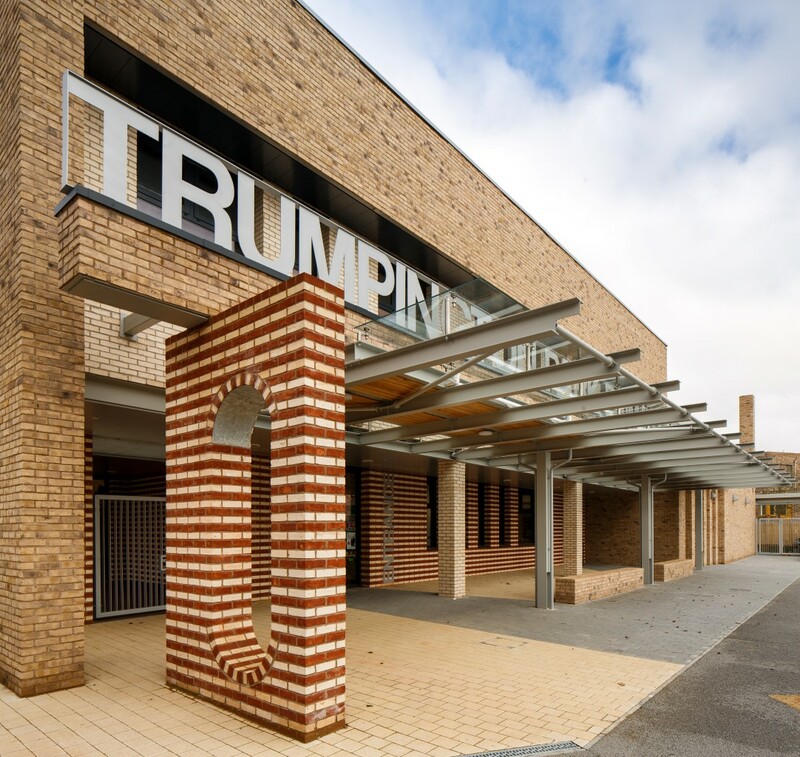 As well as blending seamlessly against a modern building such as Trumpington Park primary school the contemporary Twinfix canopies can also be used on more traditional and historic buildings to clearly show the contrast. Twinfix is a high-quality, safety-focused, British manufacturer and installer of roof glazing and canopies. Established in the late 1980s, it was the first company in Europe to develop a range of glazing bars and fixing accessories specifically designed for installing polycarbonate. 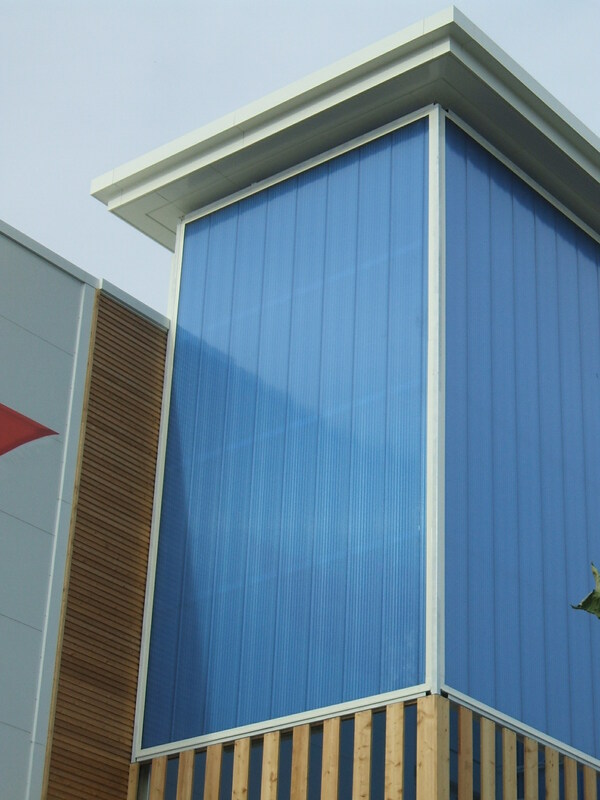 Growing from its original roots as polycarbonate and glazing bar supplier, today Twinfix offers a full range of glazing products, from the original glazing bars to the non-fragile Multi-Link-Panel which is often incorporated into canopies and shelters. Working across many sectors, from rail to education and retail, Twinfix offers a full service, from initial enquiry and advice on projects, to design, manufacture and install. We have added three more products to our portfolio of RIBA NBS Specifications, which are available to view on the Specification & BIM page of our website. 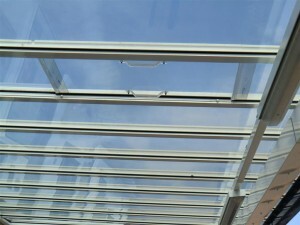 Bolted Glass Canopy – bolted glass canopy, glazed with toughened laminated glass. If you have a project in mind or would like help or advice on any of our products or services, please get in touch.